I had a 2. 5 ft. berm made from unscreened topsoil and 12 thuja green giants planted with burlap over the root balls. When I water, the water runs down the berm and I'm not sure much gets into the roots. Is the berm too steep or should the top be flatter? 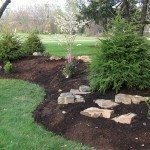 Is there a way to stop the water up (mulch) or dig holes? The trees were planted a week ago and show signs of stress which may be not enough water. Three of them are pitching forward. It is hard to say. It really depends on how much weathering the asphalt saw before it was buried. Precipitation would have leeched away most of the harmful chemicals before it was mixed in if it had seen a lot of weather after being broken up. But even if it had not, you would have to have a significant amount of the asphalt to cause damage. To be on the safe side, I would have the soil tested though. It is really, really hard to over water a newly planted tree. It would have to be in standing water in order to be over watered in their first year. And standing water would be nearly impossible on a berm. I would recommend looking into watering bags or using a drip hose looped around the base of each tree. This will allow the water to be fed slowly to the trees and would allow the water a chance to soak into the soil. I don't think your berm is too steep. It is just a matter for stabilizing and getting water to the trees while they establish. Once they are established, you should have no problem. Thank you Heather for your answer. My trees have shown some stress and the landscaper thinks they got too much water, which I don't agree with. In digging lightly in the soil used in the berm, I have found chunks of asphalt. The soil comes from a former nursery which has been subdivided and the old asphalt around the greenhouses is broken up in the soil. Would this hazardous waste cause damage to the new trees? I don't know how much is in the berm, but I would appreciate your thoughts.